Digital:works has received a Heritage Lottery Fund (HLF) Sharing Heritage grant, it was announced today. Their exciting project, ‘If Walls Could Talk’ in the Park district estate in Weymouth has been given £9,900 to record and celebrate people’s memories of prior uses of commercial buildings in the area. Project leader, Amy Hopwood on the left is joined by two volunteers to map If Walls Could Talk project. Digital:works is an arts and educational charity that works with communities, providing training and creative assistance to produce arts and media projects. 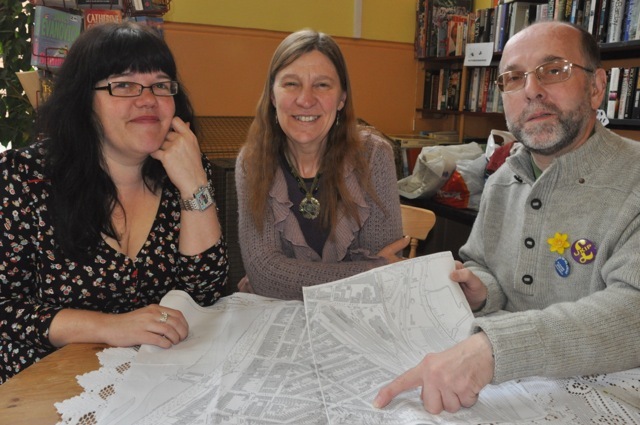 This project will bring local people together in a series of events to map out the old uses of local buildings, to discover images, describe the old interiors and collect people’s stories of incidents occurring in and around the properties. The project will culminate in a map, a digital e-booklet, a website and a series of guided tours around the estate.